Here is a workout that is quick, fun and a great one to do at home. I will be adding this as a burnout to my Bodyrock LIIT. She is a great at home trainer. Go check out her page. https://thebettyrocker.com/full-body-hiit-strength/? She has great recipes, exercises and motivation! Join me for a fast and effective HIIT workout! “HIIT” stands for high intensity interval training, and it’s one of my favorite ways to train because of how efficient it is. In just 15 minutes, this strength-building, full body circuit will get your heart rate up and your muscles working. 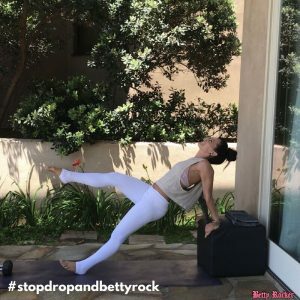 Get ready to #stopdropandbettyrock your way to a stronger version of you! You’ll want some weights (or full water bottles), an elevated surface, and maybe a little extra padding for the kneeling moves – the most important thing though is to make the workout convenient for your set up. Feel free to modify things your own way as needed. I’ll show you modifications and ways to increase the intensity as we go. Full Credit to Betty Rocker this is an excerpt. Format: Perform three rounds for the prescribed amount of time. Rest as needed. From your plank, keep your core engaged and rotate to your right, stacking your right hand below your right shoulder. You can scissor or stack your feet. If you’re feeling pretty confident in this movement add in a push up in the middle for a little extra challenge. MOD: Drop your knees down and hold the plank in a kneeling position. Keep the bottom knee down as you rotate from side to side. Start with your feet hip-width apart, engage your core then bend your knees to plant your hands below your shoulders. Jump or step your feet back to tall plank, feet out wide. Maintain a strong plank, no arched back, belly button in and up. Jack your feet in and out two times. Jump your feet back into the outside of your hands, then drive your arms up over your head into a shoulder press. Come back down and repeat for the prescribed time. Start standing, with your hands holding your weights on your shoulders. Slowly lower down to one knee, then the other. Press your left foot into the ground, and stand back up. As you come up cross your opposite knee to elbow and repeat on the other side. Please be sure to have something soft beneath your knees like a towel, mat, or carpet. Bonus Move: Alternate lifting your knee up to your chest as you come up from the dip position. Mod: Take a standing or kneeling position holding a water bottle or weight overhead. Lower and lift it toward your back, keeping your elbows in parallel to each other and your chest open. Don't let your back arch. Sit down and roll back and use your momentum to come forward, bring your feet in close to your glutes creating a strong base to support you as you stand and jump. MOD 1: When you're learning this move, keep your hands down at your sides to support you on the jump to stand. MOD 2: If you start to get winded but want to finish that interval, take the jump out and roll back to stand or just roll back and sit back up. Either way you are getting a great core workout!